President Scott announced Roger’s Ride is scheduled for August 25th, and introduced Betty Ballantyne to update the membership. Scott also announced we reached our club goal of $1,000 to purchase a granite paver for the Laconia High School athletic field walkway. The plan is to publicize the donation with a picture and press release. Scott also announced that the Meredith Kiwanis club is holding a fund-raising golf tournament at Waukewan golf course on August 10th. Betty Ballantyne reported we are the recipient of an extremely generous donation by Mill Falls in Meredith of a two-night stay at one of the two new Lodges at Mill Falls, adjacent to Church Landing. The plan is to sell 500 tickets at $5 each. The press release is completed and vendor sites need to be confirmed prior to its release, and we should see it in this week’s papers. T-shirts and koozies will also be sold. Club members are encouraged to buy one, wear it frequently and sell at least 10 raffle tickets each. This raffle should be a hot ticket since the new lodges are extraordinary. Lots of help from the entire club will be needed to make this fund-raiser a success. Please mark your calendars for Sunday, August 25th from 8 AM until mid-afternoon. The day will end with a pork BBQ at Rotary Park. 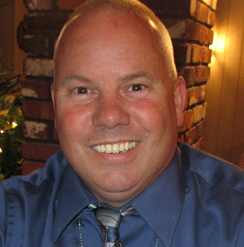 For more information on Roger's Ride, "click" here. Joe Adrignola encouraged us to consider some inter-club visits to promote this ride and sell raffle tickets. Hookset, Rochester, Berlin and Meredith were suggested. If you would like to help with Roger’s Ride, the next work session will be held at Irwin Motors on Bisson Ave. next Tuesday, July 16th at 5:15 PM. If you would like to get involved with Roger's Ride, we meet again in the second floor conference room located at Irwin Motors on Tuesday July 16th at 5:15 p.m.
Steve Loughlin announced the Lakes Region Rotary is holding an antique car show at the Lobster Pound, Weirs Beach, Saturday July 27th. For a registration form and more details, “click” here. 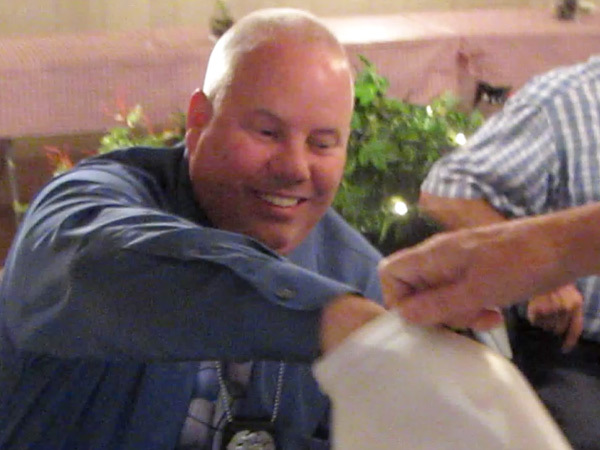 Detective Kevin Butler draws the winning ticket. 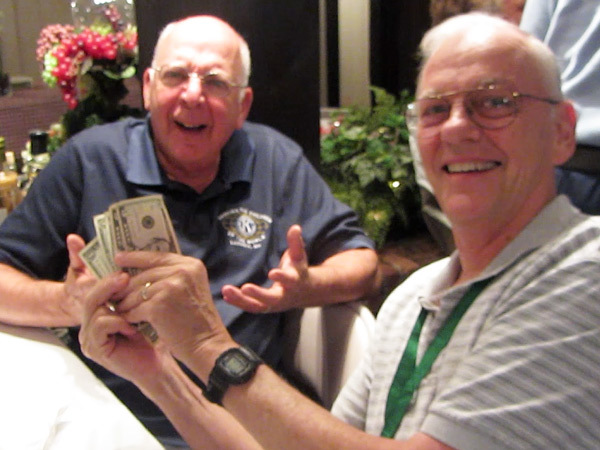 Joe Adrignola cheerfully congratulates John Walker on winning the 50 50. John was sitting next to “lucky” Joe. And "yes," John’s neck has red marks on it, and "no", it was not from Joe’s lipstick. $10 from John Walker, $5 each for two Kiwanians who on very short notice showed up to deliver groceries this morning for Laconia. Thank you: Joe Adrignola, and Jim Fortier. $1 from Betty Ballantyne for being contacted by David Lynch of the Appalachian Mountain Teen Project (AMTP) who needed help finding a van for his Teen Project. One was located and Jim Fortier was put in touch with Dave to check out the vehicle and advise whether it was a solid purchase or not. With Jim being at the center of two happy events, he received a well-deserved applause. Jim’s comment, “just doing my job”. 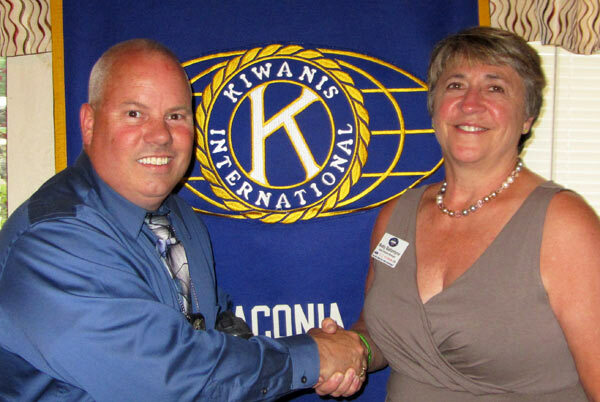 Betty Ballantyne introduced guest speaker, Detective Kevin Butler from the Laconia Police Department. 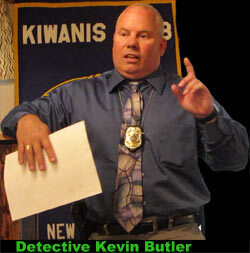 Detective Kevin Butler discussed the phenomenon of identity theft and computer-based crime. Detective Butler distributed a handout he felt every household should have which included websites to visit and tips to help you avoid being a victim, or when victimized. Kevin’s presentation included statistics and what is happening globally and locally. To no one’s surprise the biggest target of fraud are the elderly. The population over 60 years old has a 28% higher victim-of-crime rate than other age groups. Also, last year, there was $400 billion (with a B) in business losses due to fraud. •	Never open an email at all if you do not know who the sender is. •	Never answer a solicitation asking you to confirm credit card numbers. •	Do not put your bills in the outgoing mail in your mailbox. •	Be smart. If it sounds too good to be true, it probably is. ATM fraud is big nationally, but not yet in Laconia. Stolen ATM cards do happen here though. Be careful. Be aware that the US government will provide you one free credit check annually, but never do business with a site that is not a .gov website for it. Detective Butler strongly encouraged everyone to visit the Belknap County Registry of Deeds to establish a “fraud alert” to the deed of one’s home. You will be alerted to any activity on your mortgage or deed. It will not prevent a crime, but will alert you early to a potential crime. No one wants to find a surprise lien on a home at the time of sale. 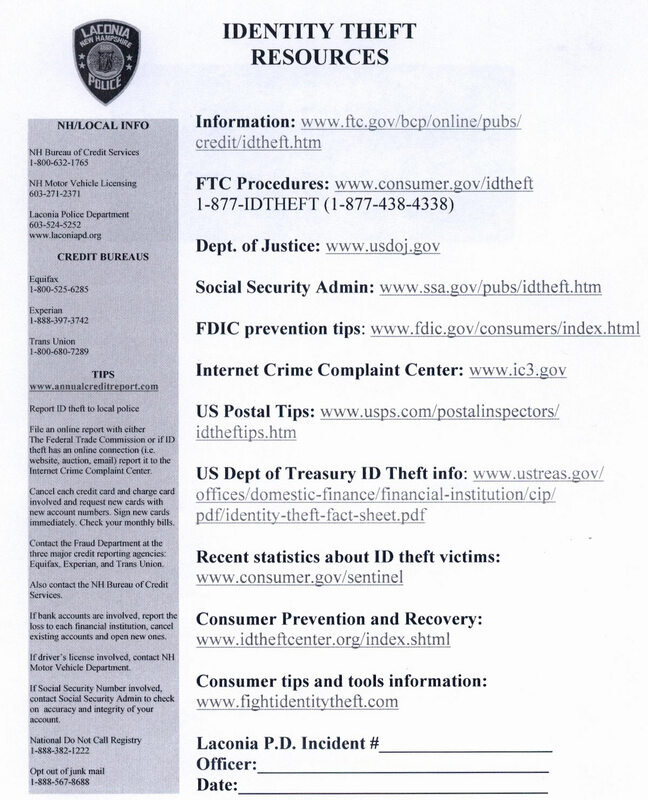 If you would like a view a copy of the Identity Theft Resources sheet that was handed out, “click” here. Program coordinator Betty Ballantyne thanks Detective Kevin Butler for his presentation.